BRITAIN IS braced for fresh flooding today as forecasters predicted more than a week's worth of rain will fall in just a few hours. In parts of western England, as much as 1.5in (40mm) of rain is expected to fall this morning - roughly a third of the average expected UK rainfall for January. Much of the downpour is set to hit communities devastated by last summer's catastrophic weather, with more severe conditions to come later in the week. Flash-flooding and heavy rainfall caused problems throughout Gloucestershire this morning. Surface water disrupted the road and rail network throughout the county, although all major routes were open. Gusts of up to 70mph were also predicted on the south coast. 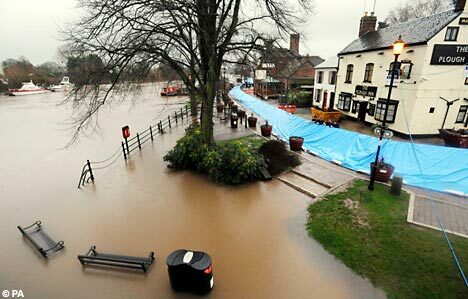 Flood warnings have remained in place since Friday, when flash flooding brought roads and railways to a standstill. More than 30mm of rain fell on January 11 and travellers were delayed by motorway closures on the M5 and train diversions on the Great Western railway. Last July, chaos hit western England and the Midlands after the worst flooding recorded since 1947.